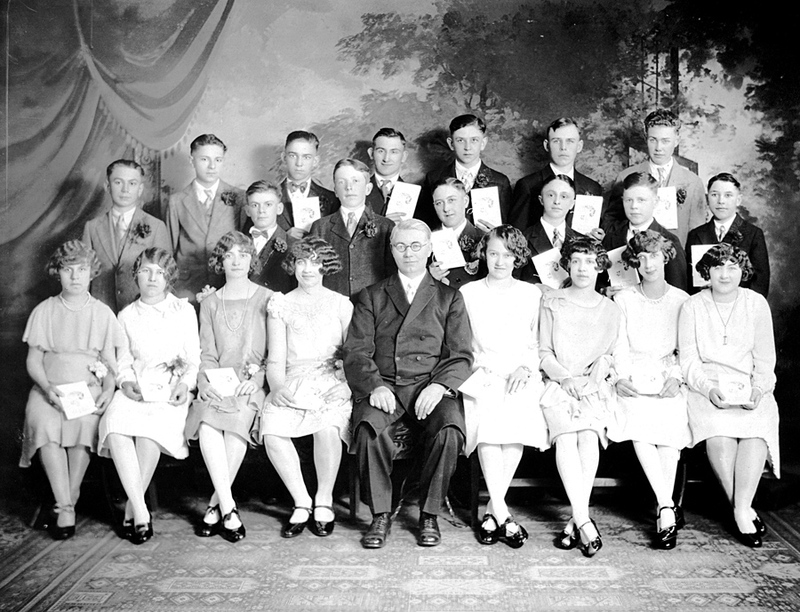 The German Evangelical Congregation Brethren Church Confirmation Class of April 1, 1928. This is the first class that was confirmed in the new church building of the German Evangelical Congregational Brethren Church that was completed in 1927. Front row from left to right: Anna Wacker, Anna Elisabeth Wacker, Emilie Reich, Sarah Wilhelm, Reverend Conrad Wagner, Katharine Leichner, Maria Hohnstein, Maria Niederhaus, Lydia Morasch. Photograph courtesy of Marie Trupp Krieger.